• "The loser always has a right to an appeal," he said. Judge Richard Leon "wrote a very thoughtful, very reasoned and very thorough order, so we feel really good." The appeal confounded media executives here in Sun Valley, who told me they thought DOJ was delaying the inevitable. 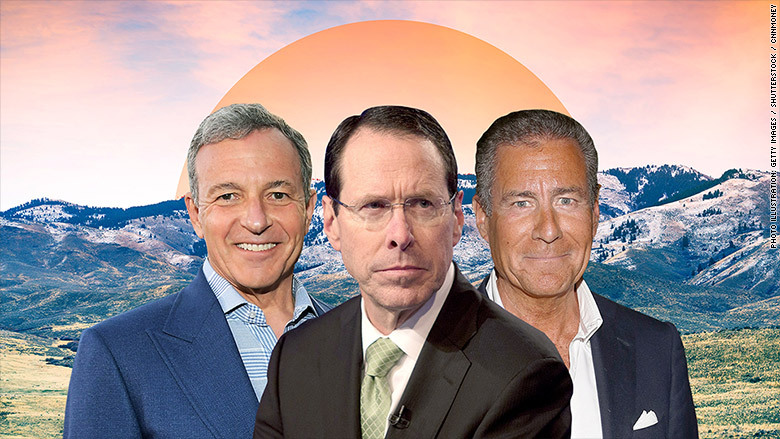 • The DOJ's decision reintroduces antitrust uncertainty around vertical mergers, meaning 21st Century Fox shareholders could be wary of selling to Comcast should Brian Roberts decide to make another bid. The Big Picture: For now, the freeze on M&A is back. AT&T can continue running WarnerMedia as it sees fit until the case is decided, but it has a new distraction on its hands at the D.C. Circuit Court of Appeals. Talk of the Lodge: Bob Iger breakfasting with Rupert Murdoch, Jerry Hall and Lachlan Murdoch yesterday morning for all to see. Plus, Rupert walking straight past Brian Roberts and ignoring him on his way over to Iger. Talk of the Locals: Tim Cook, Eddy Cue and their security guy enjoying a quiet dinner and a 2015 Nickel & Nickel Truchard Chardonnay at Michel's Christiania, the French restaurant run by Lyon transplant and former US Ski Team coach Michel Rudigoz, which had the bar buzzing. What's Next: Google Camp, the extremely exclusive summit for tech execs, media moguls and international celebrities at the Verdura resort in Sicily. There is no denying the symbolic significance of yesterday's Emmy nominations: Netflix bested HBO in Emmy nods (112 to 108) and ended HBO's 17-year run on top. What's worse, the victory came on the heels of news that AT&T is pushing HBO to do more to compete with Netflix. • Netflix's Reed Hastings and Ted Sarandos have a feather in their cap, but the feather is only good til September 17, when the actual awards are given out. • Richard Plepler can still boast the most nominations for a single show, "Game of Thrones," and HBO received more awards per show than Netflix. • HBO may well have beaten Netflix if it had a limited series in the running, which it did not. "Sharp Objects," the Amy Adams series that is poised to be a summer sensation, missed the window by a matter of months. Whatever the case, Plepler still has to deal with the headlines and the new "narrative." But neither Plepler nor Netflix are going to feel all that great if Hulu's "Handmaid's Tale" snatches the top Emmy from both of them, again. The Local: NYT's 'Daily' blitzes L.A. The New York Times has given us a first look at their new brand campaign for "The Daily," the Michael Barbaro-hosted podcast that now boasts five million monthly unique listeners and airs on more than 30 radio stations across the country. The campaign includes highway billboards and wallscapes in Los Angeles, as well as campaigns in Portland and Chicago and spots on television, Hulu and YouTube. • "In the months after Watch's launch last August, the number of people who visited the social network's new section every day to watch shows produced by ABC, A&E Networks, Discovery and other smaller media companies disappointed some show creators." • "Ads that run in the middle of videos have alienated many users, according to Facebook's own metrics." • "Some media partners have chosen not to renew their deals with Facebook, current and former employees told The Information." What's Next: Facebook Watch's first slate of news shows from CNN, Fox News and others debut on Monday, giving Facebook a chance to reverse course. Or not. Fox's coverage of the World Cup Final between France and Croatia kicks off at 7 a.m. Pacific, giving the Murdochs a chance to boost ratings on a World Cup that has suffered from the absence of the US Men's National Team. Meanwhile, YouTube TV is offering users a one-week free credit after this week's disastrous, hour-long World Cup outage. • "The deadliest teams have been those that can break quickly, often from their own half, to launch fast attacks," the FT reports. "Les Bleus have the perfect balance." What Next: Serena Williams tries to achieve the ultimate comeback in the Wimbledon Women's Final vs. Germany's Angelique Kerber, tomorrow at 6 a.m. Pacific on ESPN.